Maintain flexible attachment points to prevent pressure being applied directly on top of cut or bruise. No-tape design makes for easy use. Adjustable strap for better fit. 1. Cleanse finger and wound. 2. Stop any bleeding by applying direct pressure. 3. If wound is exposed, apply CVS Health Antibiotic Cream and cover with CVS Health Sterile Pad or Tubular Gauze. 5. Gently mold splint to finger. 6. Wrap strap around splinted finger and fasten. 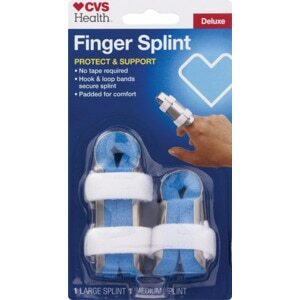 Splint should feel snug, but not too tight. Strap should not be wrapped where it will put pressure directly on the knuckle. Strap can be removed and repositioned if necessary. 7.If redness, pain or swelling persists, consult a physician at once.